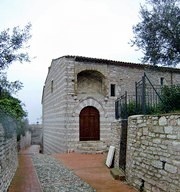 According to an inventory that was compiled in 1717 at the request of Bishp Palmerini, the Confraternita di San Gregorio was the first to be formed in Assisi and took precedence over all of the others. 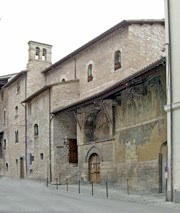 Bishop Teobaldo Pontano arranged for its meeting place to be moved to the present Oratorio di San Gregorio in 1325. Bishop Nicolò Sermattei suppressed the confraternity in 1772. 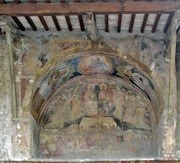 This damaged fresco is in the aedicule on the exterior facade. It is probably the image of the Virgin that Vanni di Bongiovanni financed in her will, which was signed in the presence of Fr Giovanni di Jolo in the sacristy of San Francesco in 1337. This link with the Soldani family in 1337 supports the attribution of the original fresco to Puccio Capanna, which was made by both Giorgio Vasari and his contemporary, Fra. Ludovico da Pietralunga. The original fresco depicted the Madonna and Child enthroned with SS Catherine of Alexandria and Clare. It was repainted in 1633, and figures of SS Francis and Gregory were aded at the sides of the aedicule. Both Vasari and Fra. Ludovico mentioned a nearby fresco of the Flagellation of Christ, which they also attributed to Puccio Capanna. Fra. Ludovico also mentioned a third fresco of the Crucifixion, with the same attribution. 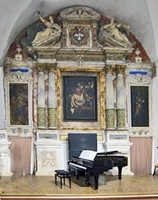 The church, which is sometimes open for concerts, has a copy of the Deposition (1602-4) by Caravaggio at the centre of the altar. (The original, which was painted for the church of Santa Maria in Vallicella in Rome, is now in the Pinacoteca Vaticana, Rome). Bishop Tegrimio Tegrimi commissioned a substantial programme of decoration of the churchfrom Giacomo Giorgetti in 1634. Only this panel of St Antony Abbot, which is on the altar on the right, survives. These large fresco fragments, which are attributed to Pace di Bartolo, were detached from the oratory and are now in the Pinacoteca Comunale. ✴St Gregory the Great enthroned below, with kneeling members of the confraternity displaying their bleeding backs. Return to Oratories of Assisi.